The premier international art show of its kind for Modern and contemporary works, Art Basel has been described as the ‘Olympics of the Art World,' Over 300 leading galleries from North America, Latin America, Europe, Asia, and Africa show the work of more than 4,000 artists, ranging from the great masters of Modern art to the latest generation of emerging stars. Megan Fox Kelly will be at Basel again this year, advising clients on the purchase of art to expand their collections, and working with them to orchestrate strategic sales of works in this international art marketplace. Art Basel's individual sectors represent every artistic medium: paintings, sculpture, installations, videos, multiples, prints, photography, and performance. Each day offers a full program of events, including symposiums, films, and artist talks, and Megan Fox Kelly will be there as VIP events begin early Tuesday morning. Further afield, exhibitions and events are offered by cultural institutions in Basel and the surrounding area, creating an exciting, region-wide art week. Art Basel hosts a series of conversations and talks on a range of subjects, including the collection and exhibition of art, understanding art from a geographical and historical perspective, and timely topics concerning the contemporary art scene. Artists, gallerists, art historians, curators, museum directors, publishers, and collectors participate in panel discussions, book signings, and interviews. HBO hosted a premiere for the documentary Remembering The Artist: Robert De Niro, Sr. on June 5, 2014 at the Museum of Modern Art in New York, followed by a private opening reception and dinner at DC Moore Gallery in Chelsea, where De Niro Sr.’s paintings and drawings are on display and for sale. The film will air on HBO on Monday, June 9, 2014 at 9pm. The exhibition continues at DC Moore Gallery, 535 West 22nd Street, NY through July 11, 2014. Follow information about the film on Facebook and Twitter. Pictured are Megan Fox Kelly, art advisor to The Estate of Robert De Niro Sr., Perri Peltz, the film's producer and co-director, and Geeta Gandbhir, co-director and editor, on the red carpet preceding the premiere at MoMA. REMEMBERING THE ARTIST is a deeply moving portrait of the painter told by art experts, the artists who worked alongside him, by De Niro Sr. himself via found footage interviews, and most affectingly by his son, the actor Robert De Niro, Jr. De Niro, Jr. reads from his father’s letters and journals and provides his own moving recollections of his father’s personal and professional struggles, as part of his own mission to honor and preserve his father’s legacy and artwork. Robert Storr, Dean of the Yale University School of Art, Irving Sandler, scholar and critic, art advisor, Megan Fox Kelly, and fellow artists Albert Kresch and Paul Resika explain how De Niro, Sr.'s professional career fell in and out of step with the American art scene--a scene that changed drastically throughout his lifetime. REMEMBERING THE ARTIST was directed by Perri Peltz and Geeta Gandbhir and produced by Perri Peltz. Rudy Valdez served as director of photography and Geeta Gandbhir served as editor. Music is by Phillip Glass. Megan Fox Kelly served as Art Advisor. The film premiered at the 2014 Sundance Film Festival and will air on HBO June 9th at 9 pm. An exhibition of the artist's work will open at DC Moore Gallery, New York on Friday, June 6th and will run through July 11th. Buying art is an increasingly complex endeavor. Professional art advisors are at the ready to help with all these tasks and more. But with the range of collecting areas increasing all the time and no regulators overseeing the industry, finding the right advisor can be a challenge. Art+Auction magazine spoke with several leading art advisors, including Megan Fox Kelly, about how clients should go about seeking their best match and maximizing that relationship. Collectors of all stripes can benefit from working with an advisor, but they may require different services depending on their level of knowledge at the outset. “Many new collectors dive in too quickly,” says Megan Fox Kelly, an advisor who has run her own firm for nearly 15 years. “Taking the time to look, read, learn—to go to museums, private collections, galleries, studios, and art fairs with your advisor and to really learn what kind of art is truly exciting to you—will make for a much more meaningful collection in the long run.” Once you establish your tastes, introductions to top dealers and access to works not available to the man off the street are the basic starting points. For those whose walls are already crowded, an adviser can provide a clear eye to help analyze the quality of holdings and identify gaps. Maintaining diverse holdings of art can involve many tasks—some esoteric and some mundane—that may be unfamiliar to collectors, and advisors can help. Read the full Art+Auction article. Sundance Film Festival Premieres Documentary Short Remembering the Artist: Robert De Niro, Sr. In 1945, painter Robert De Niro, Sr.’s work was included in the fall exhibition at Peggy Guggenheim’s Art of This Century Gallery alongside the work of Jackson Pollock and Mark Rothko. The following year, De Niro had his first solo exhibition at Guggenheim’s gallery, an extremely prestigious honor for a young painter. However, this well-received exhibition would prove to be the highpoint of De Niro, Sr.’s public success. As his work soon fell out of step with the popular art movements of the time, De Niro struggled with poverty and desperation. 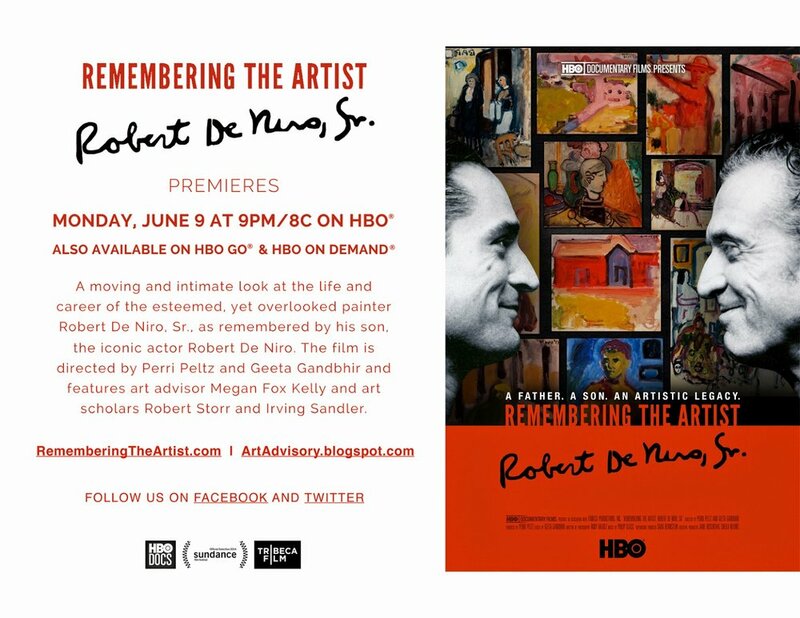 The HBO Documentary Films presentation REMEMBERING THE ARTIST: ROBERT DE NIRO, SR. is a deeply moving portrait of the painter told by art experts, the artists who worked alongside him, by De Niro, Sr. himself, via found footage interviews, and most affectingly by his son. Actor Robert De Niro, Jr. reads from his father’s letters and journals and provides his own moving recollections of his father’s personal and professional struggles as part of his own mission to honor and preserve his father’s legacy and artwork. In REMEMBERING THE ARTIST, Robert Storr, Dean of the Yale School of Art, art advisor Megan Fox Kelly, and fellow artists Albert Kresch and Paul Resika explain how De Niro, Sr.’s professional career fell in and out of step with the American art scene – a scene that changed drastically in the years leading up to World War II. In the early 1930s, avant garde European artists, politically oppressed by the Nazi party, came to the U.S. and took up teaching positions, exposing young American art students to the newest trends in European art. One of the most important of these teachers was Hans Hofmann, an Abstract Expressionist who set up schools in New York City and Provincetown, Mass., where an entire generation of young American painters studied. De Niro, Sr. studied in Provincetown and New York with Hoffman, who called him one of his most promising students ever. De Niro, Sr.’s two shows at Guggenheim’s Art of This Century followed. At a young age, he had found his artistic voice and was greatly admired by his colleagues. He was part of the celebrated New York School of artists who were well-known during the 1940s and ‘50s. His paintings blended abstract and expressionist styles with a representational subject matter, bridging the divide between European Modernism and Abstract Expressionism. De Niro, Sr.’s initial success was short-lived, as his work was eclipsed first by the American Abstract Expressionist painters and later by the emergence of Pop Art. As the art world embraced these new movements in the late 1950s and early 1960s, more traditional painters like De Niro were marginalized. De Niro went to Paris to immerse himself in the art of the masters and enliven his own work and career. But the art market of post-war France offered him little opportunity. He returned to the United States and continued to paint in relative obscurity until his death from prostate cancer in 1993 on his 71st birthday. He found solace writing about his hopes and dreams in his journals, hoping that one day, his work would be rediscovered and afforded the critical acclaim that had eluded him throughout his career. REMEMBERING THE ARTIST also traces De Niro, Sr.’s personal story from his childhood in Syracuse, NY, where he felt misunderstood by his demanding father, to his marriage to Virginia Admiral, an up-and-coming painter herself, whom he met at Hofmann’s school, to the birth of his child, Robert De Niro, Jr. in 1943. When De Niro, Jr. was a toddler, his parents separated, likely because of De Niro, Sr.’s unacknowledged homosexuality. They would, however, always remain close. As De Niro, Jr., grew up, he observed his father’s career disappointments and bouts of depression. De Niro, Jr. movingly talks of the irony of dealing with the early days of his own success as an actor while taking trips to France to try to help his father, literally carrying paintings under his arm from art gallery to art gallery. Robert De Niro, Jr. has remained committed to honoring his father’s legacy after his death, maintaining his art studio as it was when his father worked there so that his children will appreciate their grandfather’s work. REMEMBERING THE ARTIST: ROBERT DE NIRO, SR. was directed by Perri Peltz and Geeta Gandbhir and produced by Perri Peltz. Rudy Valdez served as director of photography and Geeta Gandbhir served as editor. Megan Fox Kelly served as art advisor. Music is by Phillip Glass. The 11th edition of Frieze London, the leading international contemporary art fair, takes place in London’s Regent’s Park from 17–20 October 2013. Frieze London is sponsored by Deutsche Bank for the tenth consecutive year. Redesigned for 2013, Frieze London brings 152 of the world’s leading contemporary galleries to the UK this October. The change in the design of the fair will introduce more sizable public areas and wider aisles as well as a new layout of galleries. The fair is housed in a bespoke temporary structure designed by architects Carmody Groarke to provide the best conditions for showing and viewing art. Additions to last year’s participants include: Blum & Poe (Los Angeles);Marian Goodman (New York); Galerie Max Hetzler (Berlin); Goodman Gallery (Johannesburg); Maccarone (New York); Overduin and Kite (Los Angeles); and Rodeo (Istanbul). Exhibitors from 30 countries will participate in the 11th edition of the fair confirming the fair’s position as one of the world’s leading contemporary art events. This year’s gallery list includes those from territories including Brazil, China, Columbia, Hungary, India, Korea, Mexico and South Africa. The eleventh edition features two specialist sections: Focus, dedicated to galleries up to ten years old presenting projects specifically conceived for Frieze, and Frame, for young galleries who will show solo artist presentations. The selection of the Frame galleries was advised by curators Rodrigo Moura and Tim Saltarelli. For the second time Frieze will present Frieze Masters, to coincide with Frieze London, a new fair with a contemporary perspective on historical art. Together the crossover between the two fairs build a broad international art audience. Advice for collectors from Megan Fox Kelly featured in this leading online contemporary art magazine. In an early scene from Herb & Dorothy, the 2008 documentary about famed collectors Herb and Dorothy Vogel, the unassuming elderly couple gives a tour of their minuscule New York City apartment­, which improbably holds hundreds if not thousands works of art. A wire piece by Richard Tuttle hangs over a closet; two Julian Schnabel pieces are stacked on top of each other on a small wall inlet. It's a memorable lesson that big collections sometimes come in small spaces—and that starting a collection doesn’t require endless bare walls. To find out how to most effectively display art in modest settings, we asked three art advisors to explain how to make the most out of a little. TIP 1: Define the Objective. “A question I ask my clients is: What is the purpose of this space?” art advisor Lydia Barry Kutko says. “Do you you dine here? Entertain? Read? Or is this a transitional zone to get you from one place in your home to another?” A small space might lend itself to the contemplation of a single, subtle work, or provide a powerful stage for a louder one. “Some collectors love having their most quirky, difficult and conversation-inspiring work where they hang out with friends,” Barry-Kutko adds. TIP 2: Look Outside the Box When It Comes to Galleries. TIP 3: Play to a Work’s Strengths. Some works require close observation to bloom and are in fact best suited for a smaller room or a hallway. Barry-Kutko once advised a client with "walls so close you could touch them," to place etchings there, taking advantage of the tight range. In an etching, "the tactile qualities of the impression that the plate makes on heavy cotton woven rags do have a way of bringing a viewer right inside the artist's process and intention." Kelly suggests prints, drawings, and sketches as small-scale, affordable insights into an artist's practice. "I helped put together a wonderful collection of prints and drawings by important postwar artists including Ellsworth Kelly, Robert Mangold, Ed Ruscha, Richard Serra, and Lichtenstein that filled the walls of a small residence. The simple, elegant, bold forms created a beautiful installation and a wonderful environment." TIP 4: Manage the Finer Details. Good framing and lighting doesn't require endless space. Kelly describes advising a client with a long, narrow hallway to place a group of contemporary drawings—which had gotten lost amid the rest of the collection—in that area. “We filled this hallway with her drawings collection, installed in long rows on both sides, and focused lighting along the walls, creating a beautiful little 'gallery' in her home," she says. TIP 5: Don't Forget the Bookshelf. For miniature works, a bookshelf can be a particularly elegant setting, points out art advisor Elizabeth Wingate. "To find places for art within a very small space, a client of mine removed some books from the bookcase, creating room for drawings by Alyson Shotz and Louise Bourgeois," she says. "In a small room with very high ceilings we used the bookcases to display a collection of tribal art, and in a small office we used the bookcases to display three prints by Damien Hirst and a Mel Bochner monoprint." Once you consider the bookshelf, further options open up. "I feel that any surface or wall can be used for art display," Wingate says. In the house of another collector, "the scale of a small Bochner monotype works perfectly on the wall adjacent to the stove." Building on the success of the exposition’s inaugural year, EXPO CHICAGO/2013 ensured Chicago’s place as an annual international fair destination with strong sales and 30,000 visitors. The Second iteration of Art Expo Chicago launches in September 2013 with over 125 galleries. EXPO CHICAGO, the International Exposition of Contemporary and Modern Art, presented over 125 leading international galleries at Festival Hall at Navy Pier this past September. These exceptional galleries represented 17 different countries and 36 different cities, offering a broad spectrum of modern and contemporary artwork. Led by Macarthur Fellow Jeanne Gang, Studio Gang Architects returned for the redesign of the second annual exposition. Studio Gang’s design for EXPO CHICAGO’s interior environment brought clarity, efficiency, comfort, and energy to the fair. The floor plan, patterned after the city’s gridded streets and lined with exhibition spaces, enabled visitors to view every gallery in sequence without losing their way. This redesign included EXPO VIDEO, an exhibition area and lounge, highlighting the work of multiple video artists. Natural wood display stands and log seating defined the lounge space without obstructing views to the galleries beyond. EXPO CHICAGO’s commitment to design continued with the addition of “Bend,” a series of upholstered foam elements that provided seating under the main center atrium, designed by the renowned firm Snarkitecture, in partnership with Volume Gallery of Chicago along with their unique display fixtures designed for the Museum of Contemporary Art Pop-Up Bookstore at EXPO CHICAGO. Standout presentations of contemporary art were made by Matthew Marks Gallery, who featured elegant works on paper by Anne Truitt, Ellsworth Kelly, and Terry Winters, and Barbara Mathes Gallery who presented a striking group minimalist works including a trio of Robert Mangold pastels, a Carl Andre floor piece and a black and white painting by Fred Hammersley. Teaming up to present the most imaginatively curated exhibition at the fair, Eyeline, the always inventive Corbett vs. Dempsey Gallery of Chicago with David Nolan Gallery of New York, combined two booths, hanging drawings, paintings, photographs and sculpture focused exclusively on the portrait. Works spanning from modernist to contemporary were hung on the same horizontal "eyeline", creating exciting visual conversations between works. Recognizing the importance of both established and emerging galleries, EXPO CHICAGO also presented EXPOSURE, a special section of the fair reserved for newer galleries. Each gallery highlighted one or two artists from their program. This was a fantastic opportunity for these emerging galleries to gain critical visibility and for visitors to discover new talent. In 2013, all participating galleries were in operation for seven years or less. Presented in partnership with The School ofthe Art Institute of Chicago (SAIC), /Dialogues is a year-round program of symposia, panel discussions, and provocative artistic discourse. The series culminated with informative and thought-provoking daily events during the fair, highlighting the field’s leading artists, architects, curators, designers and arts professionals and the current issues that engage them. Adding art to your portfolio can be a lot trickier than putting it on your wall. With regular investments looking uncertain these days, individuals and financial pros are snapping up artwork to diversify their holdings—and, with any luck, realize big returns. But with more competition for desired pieces, prices are soaring ever higher and the chances of making a costly mistake are rising too. Here's a look at some of the pitfalls of art investors face and how to avoid them. Contemporary art can be alluring for investors. There's an active global market for these pieces that makes them easy to buy and sell, and prices can rise in a hurry. But they can fall just as fast. The market relies on hype to build up certain artists, and that doesn't last. So, experts advise buyers to move very cautiously when it comes to the current big names. "Don't buy what everyone else is buying," advises Philip Hoffman, director of London's private-equity Fine Art Fund. "You may be too late. You may be coming into the market just as the savvy investors are bailing out." For one recent example, look at Damien Hirst, says Jeff Rabin, principal and co-founder of Artvest Partners, an independent art-advisory firm in New York. In September 2008, Sotheby's held a much-ballyhooed sale of the artist's work, with prices ranging as high as $18.6 million. But the market for Mr. Hirst's work has cooled, and those who bought at the sale "would have, on average, paid significantly more than those works are currently commanding." Mr. Rabin recommends that collectors "love what they're buying," because there's no guarantee of a secondary market, and they may be stuck with it. When a piece of art sets a new auction record, it can elevate gallery prices and estimates for similar works overnight. But most investment-grade artworks rise in value gradually. "The market doesn't move up 20% to 30% per year," says Enrique E. Lieberman, president of the Art Fund Association, a membership organization of private-equity art funds. "You generally have to think in terms of a five- to 15-year plan in order to realize profits." Even when artwork does soar in value rapidly, owners who go for a quick kill often find themselves disappointed—thanks to high transaction costs. Let's say you buy a piece of art and sell it a year later for 50% more. Great profit? Not really. If you sell it through a gallery or auction house, you'll likely have to fork over a 20% to 30% sales commission or similar fee. Then there's the money you already paid to maintain the artwork, such as storage, insurance and framing. When you factor all that in, your 50% profit has vanished. The smarter strategy to pursue: Wait and let the art gradually appreciate, so those costs make up a smaller chunk of your profits. "You want to amortize the high transaction costs over time," says Michael Moses, a retired New York University business professor who charts art-auction results against the Standard & Poor's index. "You have to be a long-term investor," he says, noting that the average work of art on his index has been held for 19 to 20 years. You can study for years to develop your eye for art and your understanding of the market. But the reality is, most people don't have the time—and they need some help figuring out what to buy. As art investing has gotten more popular, advisers have sprung up to offer guidance to would-be collectors, weighing the relative quality and importance of an artwork, researching provenance and sales history, and appraising current value. Advisers, for instance, can help steer you away from second-rate pieces. We've all heard of Picasso, Matisse, Renoir, Warhol and the multimillion-dollar prices that their works have achieved at auction. However, not every Picasso, Matisse, Renoir and Warhol earns those prices. "During the late 1980s and early '90s, a lot of Japanese collectors were spending millions of dollars buying second-rate Impressionist paintings that, when the Japanese economy began to decline and these collectors needed money, they couldn't easily sell," recalls Barbara Chu, partner at New York's Emigrant Bank Fine Art Finance. Pros can also steer you away from "bargains" that aren't as good as they look. Algur Meadows, the Texas oilman and art collector, liked buying works by famous 17th- and 18th-century Spanish artists—and thinking that he got the paintings for a steal. However, after Meadows donated his collection to Southern Methodist University in Dallas in the 1960s, it was discovered that almost all of the works by the most important artists were fakes. How do you identify the best experts? The art market is cyclical, and an adviser should be attuned to what's in and out. The person should also specialize "in the area in which you are interested in collecting," says Megan Fox Kelly, an independent art adviser in New York City. To get a full picture of the adviser's work, ask for references of past and current clients. You can also look for membership in an association, which shows the expert has gained a solid reputation among peers. Some dealers, for instance, are part of the Art Dealers Association of America, or regional gallery-owners' groups. For independent art advisers, look for members of the Association of Professional Art Advisors. And some managers of art funds are members of the Art Fund Association and the Art Investment Council. Mr. Grant is a writer in Amherst, Mass. He can be reached at reports@wsj.com. Frieze Art Fair 2012 opens in London on October 10 with 175 international contemporary galleries. The Tenth Edition of Frieze will include Frieze Masters, a contemporary take on historical art, and Focus, a special section for newly established galleries. The tenth edition of Frieze London, the leading international contemporary art fair, takes place in London’s Regent’s Park from 11–14 October 2012. With exhibitors from 35 countries, the tenth edition of Frieze London is the most international event organized by Frieze; confirming the fair’s position as one of the world’s leading contemporary art events. Frieze London is a carefully selected presentation of 175 of the most forward- thinking contemporary galleries and will present new work by over 1,000 of the world’s most innovative artists. This year the fair is once again housed in a bespoke temporary structure designed by architects Carmody Groarke. The tenth edition features a new section: Focus, open to galleries established after 2001, showing up to three artists.. The Frame section of the fair is dedicated to galleries under six-years old, showing solo artist presentations. This year, coinciding with Frieze London, Frieze also introduces Frieze Masters, a new fair with a contemporary perspective on historical art. Together the crossover between the two fairs will make London the focus for a broad international art audience.